Vice President Pence speaking at the second National Space Council meeting in February, is expected to make a space policy announcement in a speech next Monday in Colorado. 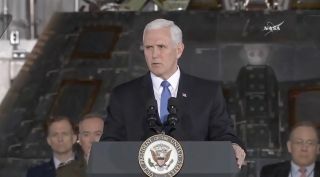 WASHINGTON — With Vice President Pence expected to make another space policy announcement next week, industry and government officials offered their endorsement of the work the National Space Council has done since it was reconstituted last year. Pence is scheduled to speak April 16 at the 34th Space Symposium in Colorado Springs. The administration has not released details about what Pence plans to say, but many in the space community expect him to make some kind of announcement on space policy. Pace declined to comment on what Pence planned to say at the Symposium. "I don't want to make news ahead of my boss' speech," he said at an event here organized by Politico. Asked later how significant any policy announcement would be, Pace responded, "All policy announcements are important." One recent area of activity for the council has been regulatory issues. At its previous public meeting in February at the Kennedy Space Center, the council approved several recommendations devoted to regulatory reform for various commercial space activities, from streamlined launch licensing to improvements in remote sensing regulations. Those recommendations have yet to be formally enacted into policy, though. "Regulatory reform is a big part of this administration's agenda, and it includes space as well," he said. He cited a need to update regulations that are in some cases "woefully out of date," including remote sensing regulations he helped develop in the 1990s. "The requirements are changing very much and the government has not caught up." A related issue is how to deal with oversight, required by the Outer Space Treaty, of so-called "non-traditional" space activities, like satellite servicing and commercial space habitats. "We don't want to create a detailed licensing regime before we understand the technology," he said, "but we can't do nothing because we have an international responsibility to provide authorization and continuing supervision." The emphasis on regulatory reform came after the council initially focused its attention on space exploration, including a shift back to the moon. "The thing that most symbolizes, exemplifies American values and aspirations is exploration," he said. Pace noted he was a critic of the Obama administration's space exploration plans, which included the Asteroid Redirect Mission as a stepping-stone to Mars, primarily for geopolitical reasons. "It didn't provide enough opportunities for either taking along the private sector as well as partnering with other countries who we need to help shape that future environment," he said. "Bringing the moon back in and providing that as a center of direction for the next step, with Mars in the distance, was not just a space issue, it was actually a geopolitical choice," he said. The signing of Space Policy Directive 1 in December by President Trump, and increased funding for NASA exploration programs, implemented those plans. Those and other activities of the National Space Council, formally reestablished by executive order last June, won praise from other participants at the forum. "I think it's great that the National Space Council has come back together," said Rep. Ami Bera (D-Calif.), ranking member of the House space subcommittee. He argued that the council can provide policy stability needed to carry out long-term initiatives, like space exploration. "To me, the biggest thing is vision and stability," said Rep. Randy Hultgren (R-Ill.), a member of the House Science Committee. "I'm excited about it. I think it's really important." Dennis Muilenburg, chief executive of Boeing, backed the administration's work to reestablish the National Space Council and focus attention on space policy issues. "The advocacy behind that, the energy that it's bringing back to space is important," he said at the event. Muilenburg is one of nearly 30 people nominated by the White House in February to serve on a Users Advisory Group to support the council. Pace said that, within the White House, the space council has good relationships with other offices, including the Office of Management and Budget and the National Security Council. That's despite, he said, having a "thin" team, noting in particular the nomination of Jim Bridenstine as NASA administrator that is still pending in the Senate. Pace added that Vice President Pence, the chairman of the council, is personally involved, and that he met with him to discuss space issues as recently as April 11. "The boss is definitely enthusiastic," Pace said. "There's nothing more terrifying than a boss who cares about what you do, and the vice president cares."